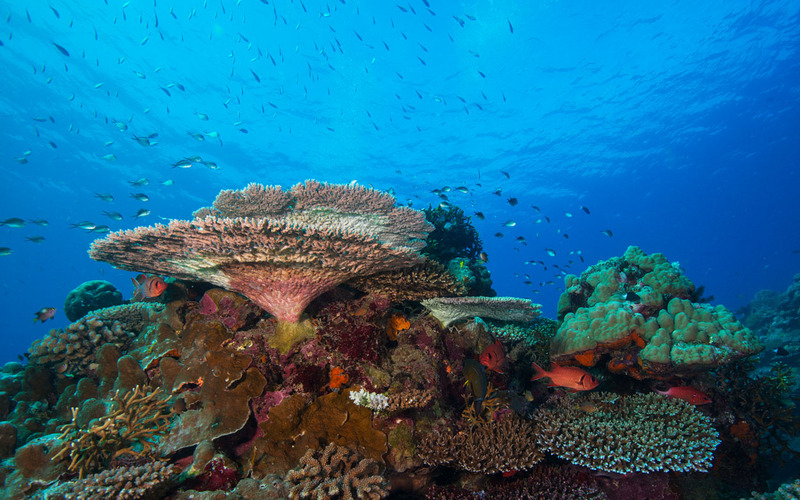 Diving Port Vila is easy: stay a week at Hideaway Island Resort, or dive for a day or two with Big Blue Vanuatu right in the town centre. Discover Scuba Diving or even learn to dive and get the Open Water Certification with either. 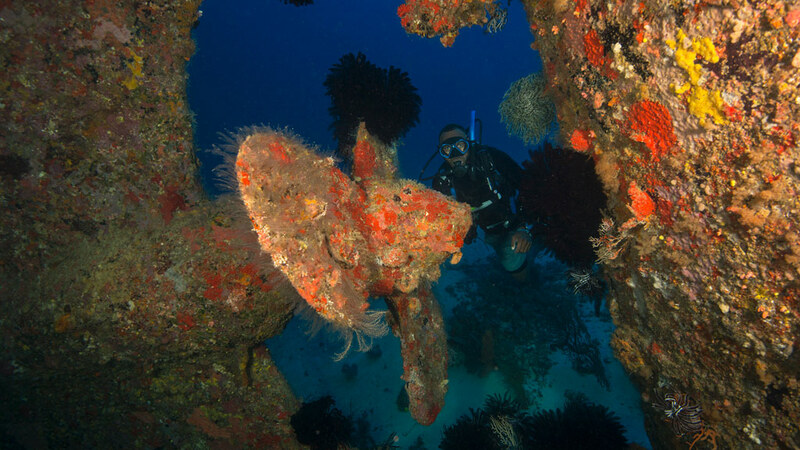 Those looking for more adventure can dive the Semele Federesen – the wreck of an inter-island trader which lies with its propellor at 40m, or the Cathedral, an impressive tall narrow cavern stretching down to 28m. Port Vila is the most cosmopolitan city of Vanuatu and boasts a number of 5 star resorts. There is usually a cruise liner berthed there, and the locals are very attentive ferrying the passengers to and from the various activities that are available nearby. Having a long association with the French, Port Vila’s culinary offerings are a cut above the average South Pacific norm. Port Vila is on the same latitude as Cooktown, in far north Queensland and Fiji, and the same longitude as Norfolk Island. Flying time is less than 4 hours from Sydney. 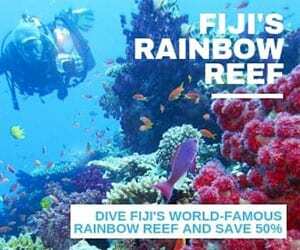 Hideaway Island Dive: a fully equipped 5-star PADI dive resort, with two boats, and over 20 dive sites within a ten minute boat ride in Mele Bay. 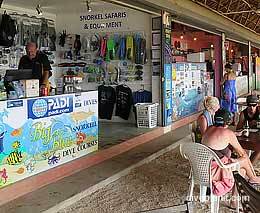 Big Blue: located right on the waterfront in central Port Vila, also 5-star PADI rated. They have two boats and about 12 crew and guides of different nationalities and ages. They can quickly transport divers out to their favourite dive sites, all within a short boat ride. 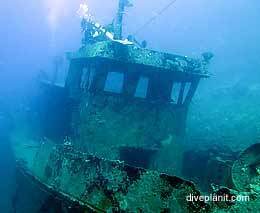 Dive sites around Port Vila tend to be scenic reef dives, but there are a number of small wrecks scattered about. 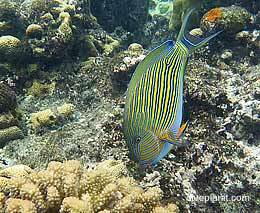 There are also a few caverns and tall reefs and wall offering some interesting swim throughs. If you are experienced and looking for adventure check out the more advanced sites on the operator’s web sites and see if you can’t get these locked in, in advance. (Subject to conditions obviously). 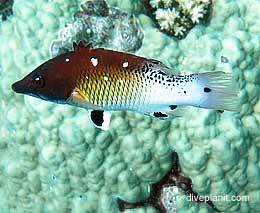 The Semele Federsen is particularly popular and very colourful wreck. 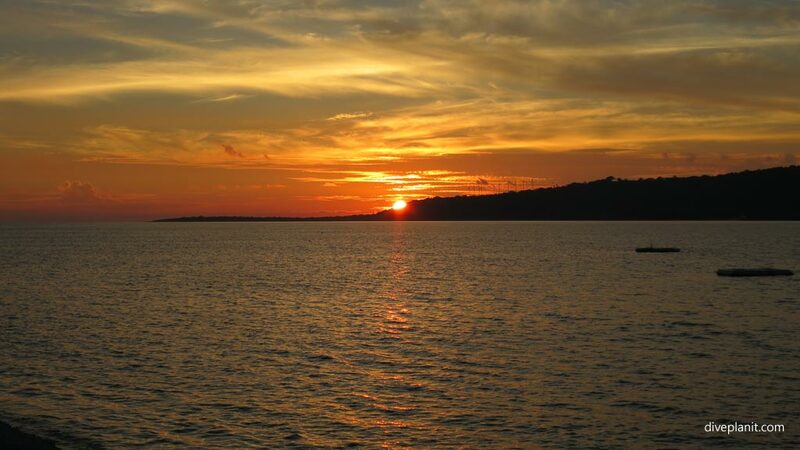 Port Vila has many great restaurants to choose from. As the reputation of establishments can vary over time, the best practice is to ask around according to what you fancy. Unless you have a particular need to be very mobile there’s little point in hiring a car, as in most cases, the operators, whether a resort or an attraction, will get you to where you need to go in reasonable comfort. Failing that – ask them to call you a taxi. 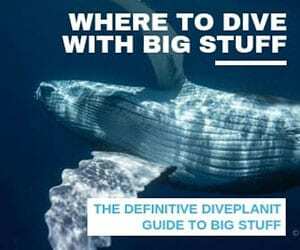 All of these I can personally recommend, either for the non-diving days, or for the non-divers in the party. It’s safer than houses and a lot more fun! High above the forest on a series of zip lines including two that cross the 80m deep canyon and back. You are on a Saferoller™ runner (Swiss technology) and cannot be removed from the wire. So the advantage is that you cannot become accidentally unhooked or unhook yourself, which also means that once you’re in the line and clipped on there’s no going back! 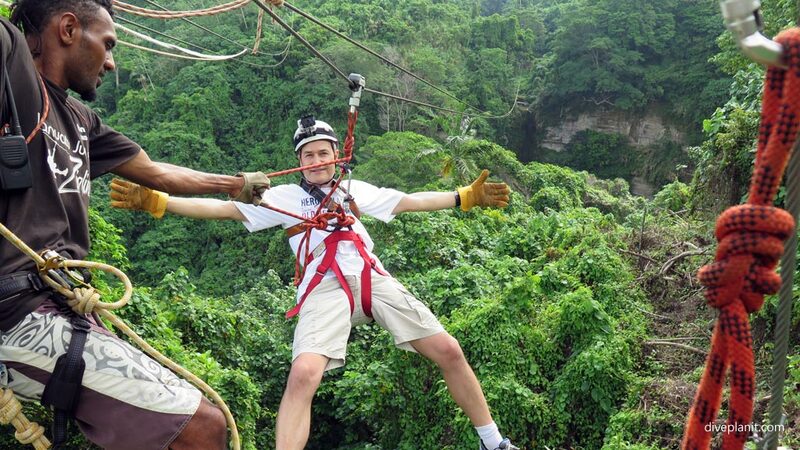 The guys running the zip line are really helpful and also clearly have a lot of fun guiding you, which is quite contagious and ensures that you have a lot of fun too. There are three guides per group, two ahead, and one behind. The second guide is there to manage the safety brake and the third to ensure that you land elegantly on the next platform. The first one always stays with you to ensure that you depart the current platform with some decorum at least. They are also great cameramen – so if you entrust your camera to one of them you’ll have the memories to treasure and you won’t even have to buy the DVD (There is no DVD – Ed.) There are fantastic views right out over Mele Bay and if you’re staying at Hideaway Bay, you’ll probably be to see your room. We could see clear over the next rise into Port Vila harbour. (Transport is usually included. Check out their website and book on-line in advance to avoid disappointment). If there is anyone in your party who doesn’t want to do the zip line they can watch from the path below or take a walk around the adjacent Summit Gardens. 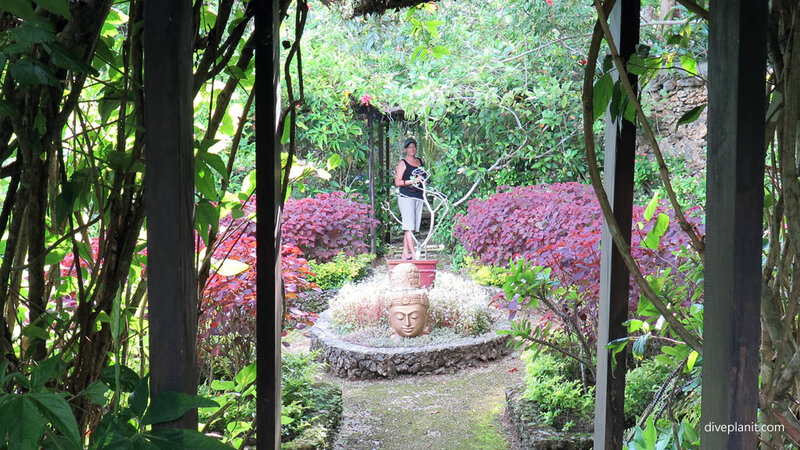 The Summit Gardens were created by Jim and Lesley Batty to showcase the beauty of Vanuatu. There are eleven named gardens, spread over 10 hectares, all distinctly different, unfolding as a series of surprises as you follow the meandering pathways and steps. At nearly 200m above sea level, the escarpment garden offers you breathtaking views over Mele Bay. There is also a cafe serving excellent breakfast and lunch. A freshwater waterpark complete with beautiful cascading freshwater waterfalls and clear rock pools for a refreshing swim. They are near the bottom of the Summit, so you can include in the one trip. 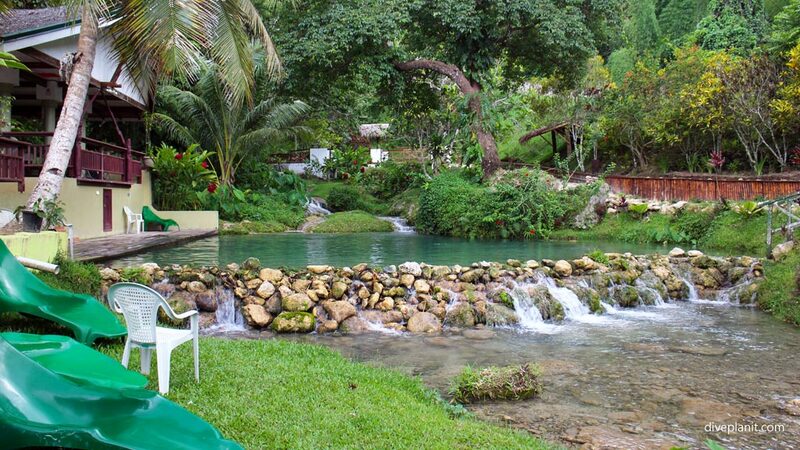 Spend the day in your swimmers and enjoy a natural massage under the waterfall, or simply sit under the cool shade and enjoy the green scenery. The bread leaves a little to be desired but if you search out the right places you might just discover the best little patisserie in town rumoured to be the “Au Peche Mignon” in Port Vila. 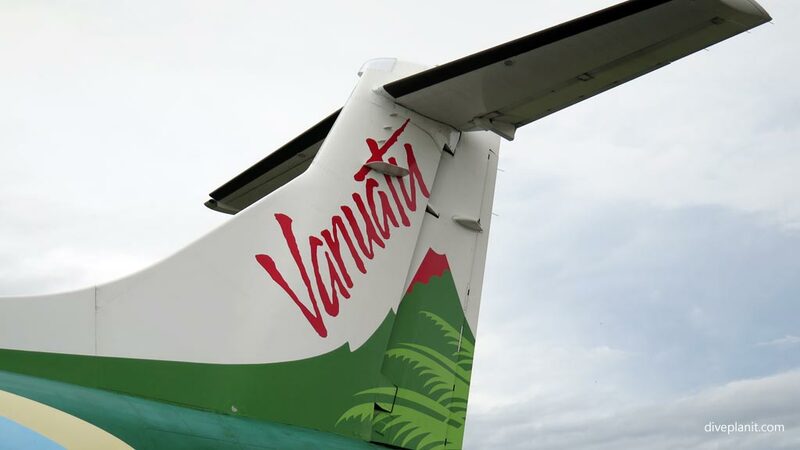 Air Vanuatu has direct flights to Port Vila from Sydney, Brisbane and Auckland – but not every day. There are also flights from Nadi and Suva (Fiji), Noumea (New Caledonia), and Honiara (Solomon Islands) to Port Vila – if you were thinking of taking in some of the neighbouring islands; but again, not every day. Check out their schedule here.